After the eclipse, the group split up and five members headed back to Cairo, from where our expedition started. The rest of us headed back out into the desert on a modified itinerary, as we could not enter Libya as originally planned. My personal goals for this trip were firstly, to see the pyramids of Giza while I was in Cairo. (Did that - though I unfortunately did not get to see inside the Great Pyramid of Khufu). Secondly, to see my first total eclipse. 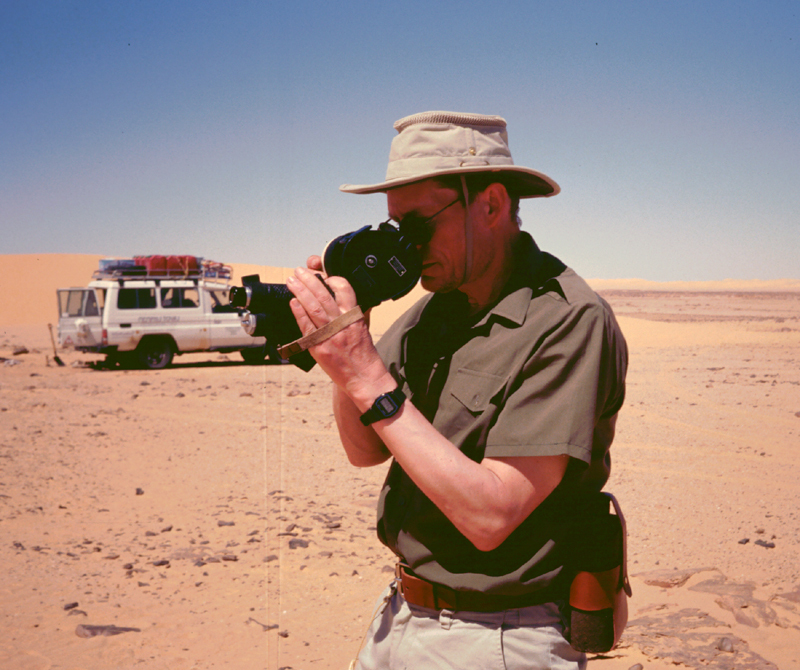 And thirdly, to try out the techniques of inland celestial navigation (CN), which is my particular interest, while travelling around the desert. My experiences in achieving this last goal are the primary focus of this account of our expedition. When GPS receivers can give a position accurate to within a couple of metres at the flick of a switch, why bother pursuing the ancient art of celestial navigation? It is time consuming, labour intensive and the final position will only be good to a couple of kilometres at best - a thousand time worse than the GPS. The answer often given is that a backup navigation system which is totally independent of the satellites and electrical requirements of the GPS system, is useful - if not necessary - to have. I have used this argument myself. But in truth, given their small size, low price and ready availability, the best backup for a GPS receiver is another GPS receiver. The chances of the satellite system being switched off or unavailable for some reason, even in times of war it seems, are next to zero. Far higher are the chances that the receiver will fail due to dust, heat, water ingress or sheer cussidness! That said, I heard of a group which recently went out into the desert with two GPS receivers, both of which failed and they had to be guided back to civilization by a passing Touareg. Our group had at least four GPS receivers however, so the chances of all four failing were tiny. The traditional form of inland navigation is to keep a running plot of your position by ded (short for "deduced") reckoning while travelling, and use celestial navigation to "fix" your position when stopped at a resting place, such as the night's campsite. The running plot is plotted on a map, so you can have a pretty good idea where you are at all times. A list of waypoints in the GPS receiver does the same job - so long as the GPS receiver is functioning and you can get at them! 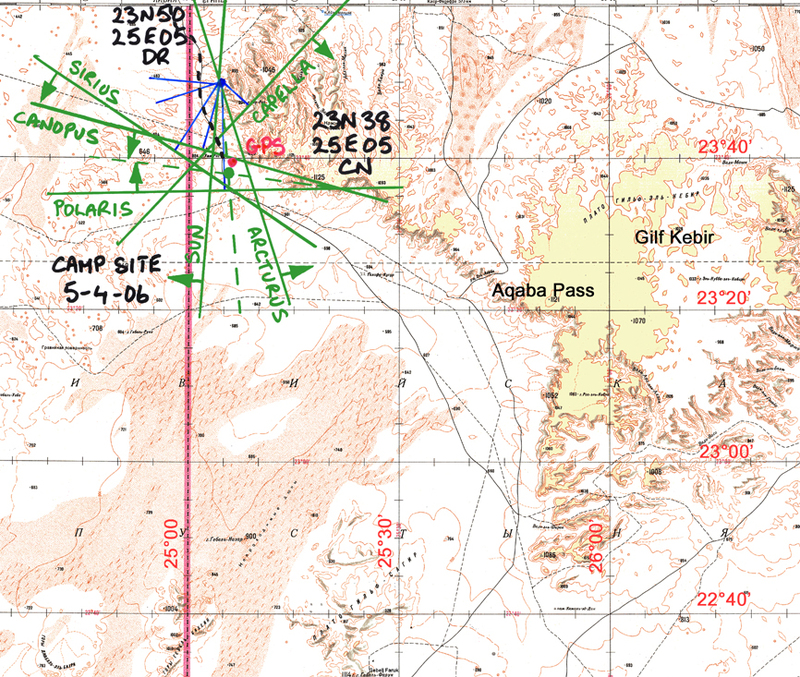 If the group with the two dud GPS receivers had been keeping a plot of their position on a map as they went, they would not have needed a passing Touareg to get them back to town. So, traditional navigation methods force you to be more aware of the country you are in. They force you to use a map more intensively, which keeps you aware of the pleasures - and hazards - you are approaching. All this serves to heighten the experience of the journey. Apart from this, the only time when one would seriously consider the use of celestial navigation over the ubiquitous GPS, is when the proposed journey is going to take a long time (several weeks or more) and the transport will rely on muscle rather than mineral power. 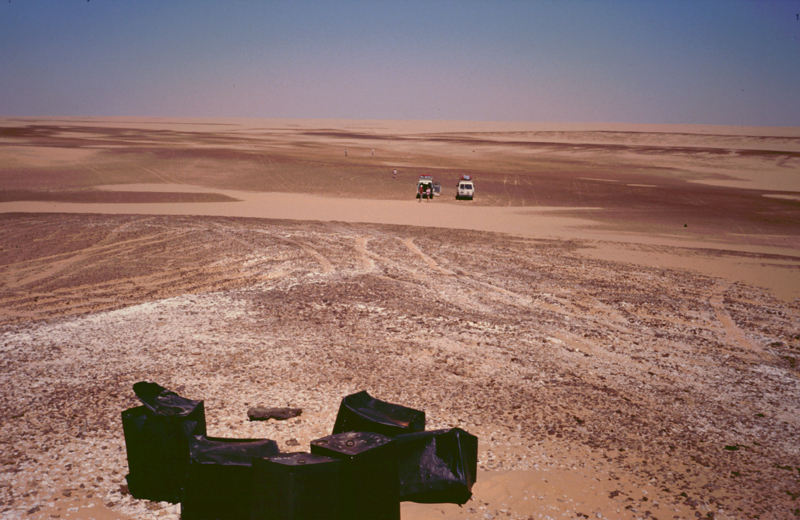 When crossing the Sahara pushing a wheelbarrow for example, as one intrepid character recently did, it can be argued that for reliability and simplicity it is best to avoid the power hungry GPS receiver and use ded reckoning in combination with celestial navigation, both of which can be done with no electrical power requirements at all. However, given their small size, low price and ready availability, it is always worth taking a GPS along as a backup to the celestial navigation! It should be emphasised that for our group, the primary means of navigating our way around the Sahara desert was the GPS receiver. At no time was my navigating with compass and sextant ever used or needed to determine our position. My navigating was used for my own benefit to find out where we were on the map and to hone my skills in using celestial navigation in an inland setting. 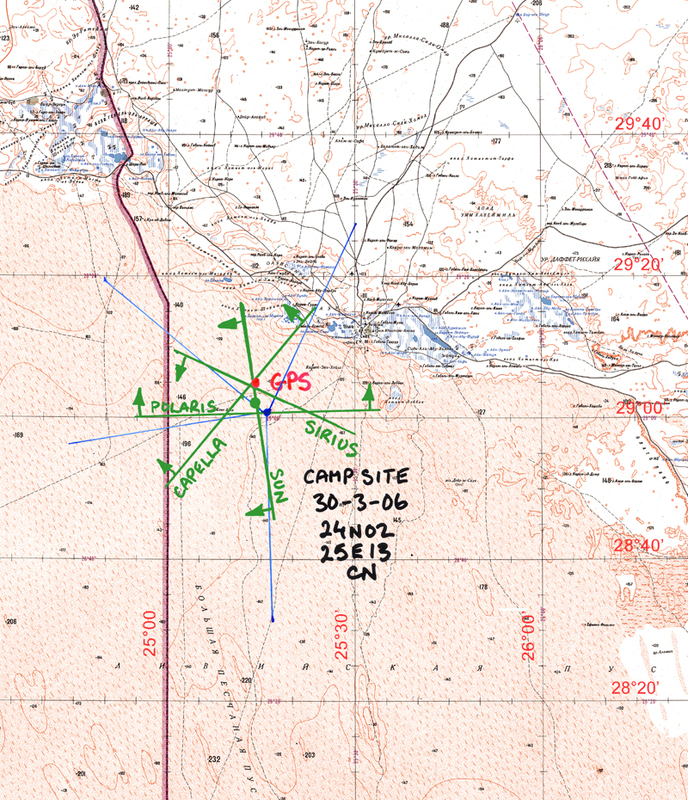 Having used CN to find our the position of our campsites as best I could, I usually checked the position against a GPS to see how well I was doing. This feedback quickly calibrated me as to the sort of accuracy I could expect from a CN derived position. It also allowed me to indentify problems as they developed and work out strategies to get around the problems. All the photos shown here were taken by myself. On the trip, I used an Olympus Trip 35, now almost 30 years old. I figured its simplicity and ruggedness would ensure its survival until the end of the trip. It did. The Olympus Trip is a fine camera, but with its fixed lens it is rather limiting on what one can do with it. The resulting slides were scanned using a PrimeFilm 3600u scanner. The results were....OK. The maps shown are from the Soviet World Series or were drawn by myself. All position line fixes were prepared by myself. Consequently, the copyrights on on all images are mine. If you want to use any of these images, please ask me first. Hovering over the image with your curser will tell you what it is about. Clicking on the image will usually present you with a larger version to see the detail better. Underneath this main page are pages on the equipment I used, explanation of navigation terms, Libyan Desert Glass, the "Largest Crater in the Great Sahara" and the fabled lost city of Zerzura. If these interest you, links are provided. My particular interest in using celestial navigation is to keep found while hiking with a backpack in country where (hopefully) I will not be seeing another human being. 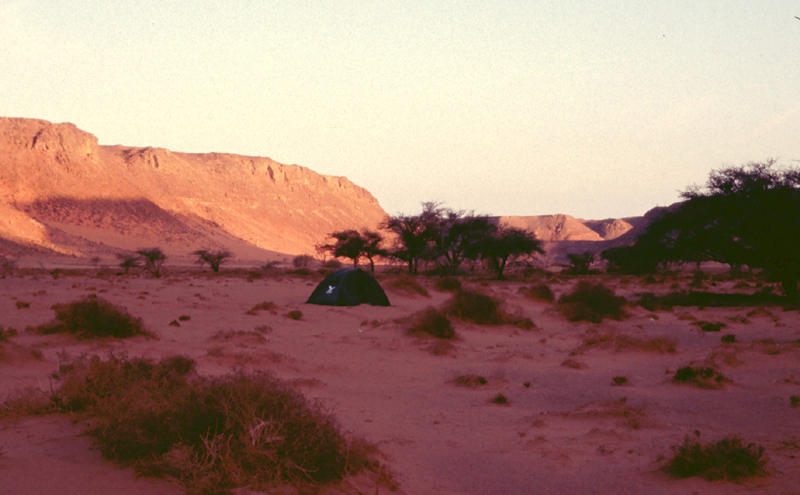 On this trip too, we were very restricted on the amount of luggage we could bring, and at night we camped in tents in the desert. The choice of my navigating equipment reflects this strong requirement of lightness and low volume. A fuller description of my instruments and equipment is given elsewhere, but it should be mentioned here that the sextant I used was a Link A-12 bubble sextant. 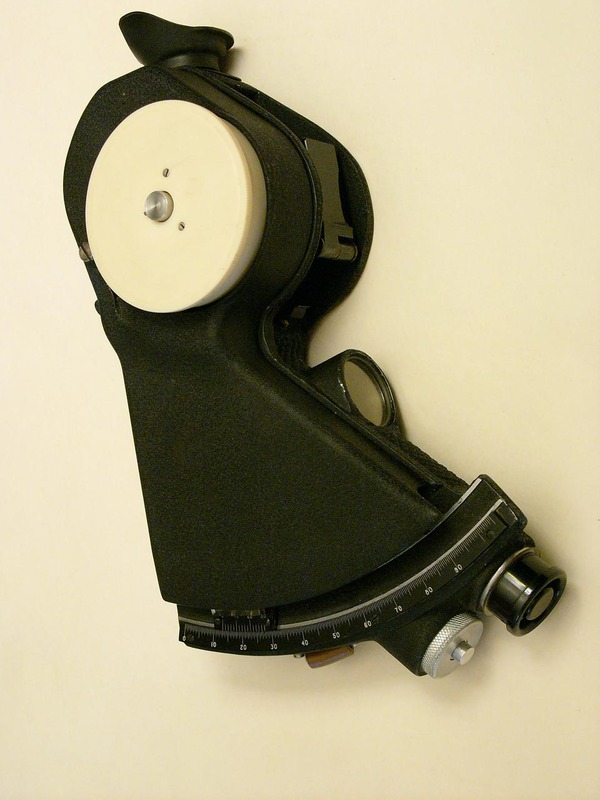 This is an aircraft sextant that was designed for use in open cockpit aircraft before WWII. It has no telescope (unity magnification) and the vernier has 2' graduations, but with care it can be read to 1'. Its relative lack of precision compared to a marine sextant or a theodolite is no real handicap for celestial navigation work, where an accuracy of 1' or so is usually the best that can be hoped for. But for ease of use both taking sun sights during the day and for star sights at night, I do not think the A-12 can be equaled. On returning to Siwa after seeing the eclipse, we camped for the night before entering Siwa the next day. 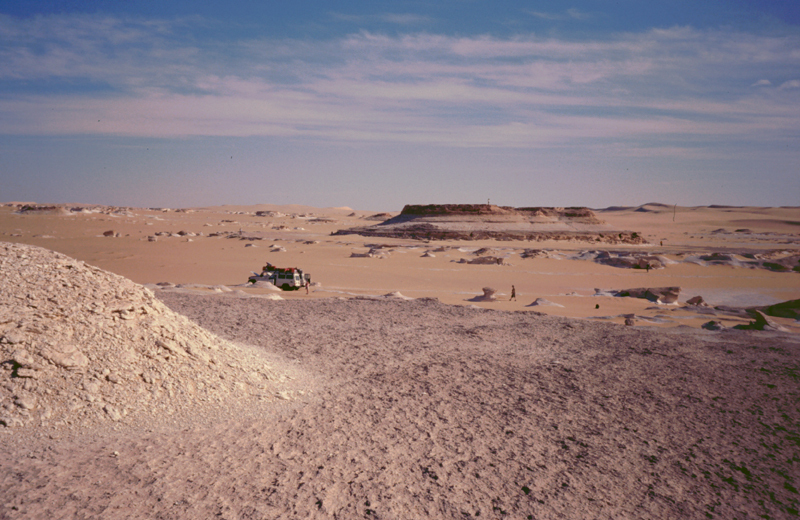 Our camp site was in the miocene fossil beds about 15-20 kilometres South West of the Siwa oasis basin. My tent was pitched next to what looked like the the rubbish dump of a dinosaur oyster bar, a large dome shaped aggregation of oyster shells, sitting on top of a layer of hard, fossilised chalk. The wind and sand had sculpted the soft rock into wonderful shapes. My estimate for our position was 29N01,25E16. I took a sun sight in the evening, which was in fact an average of three sun sights. The average time was 14:53:45 GMT and the average Hs (sextant altitude corrected for index error and refraction) was 21� 27'. The index error I used was +7', which had been the index error for this sextant for the previous twenty years. Local time was two hours ahead of GMT, so it was near five o'clock in the evening when I took these sights. Later on, at 17:20:45 GMT I took a single sighting of Polaris, getting an Hs of 29� 13'. A single sighting of Sirius at 17:50:55 GMT gave an Hs of 40� 27', and a single sighting of Capella at 17:53:59 GMT gave an Hs of 52� 56'. 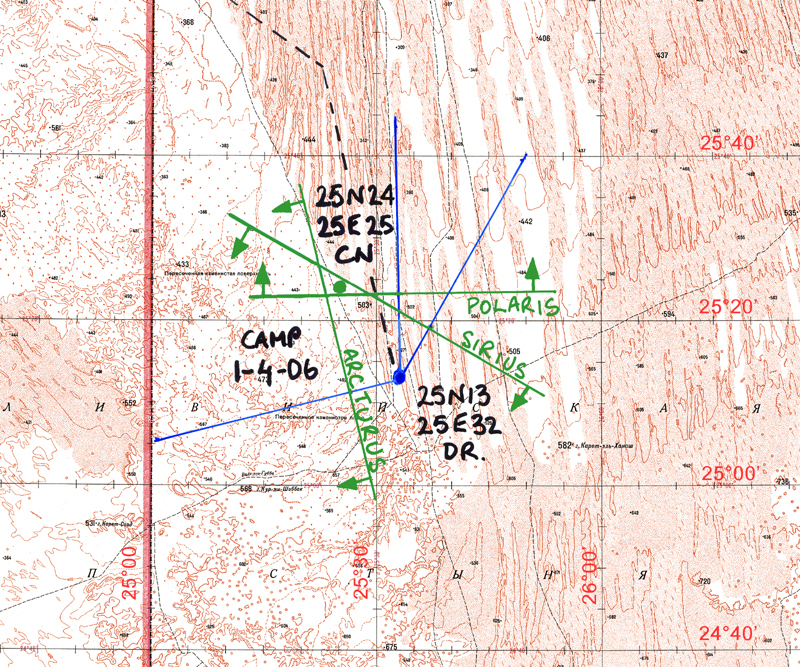 Using these sightings, I was able to calculate azimuth bearings and intercepts from the estimated position, and so plot position lines on the map. 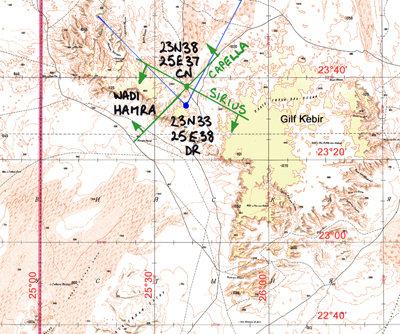 A part of the Soviet World Series map of the Siwa area is shown on the right with a plot of our position. (Clicking on the Maps will give a larger map to see the detail better). 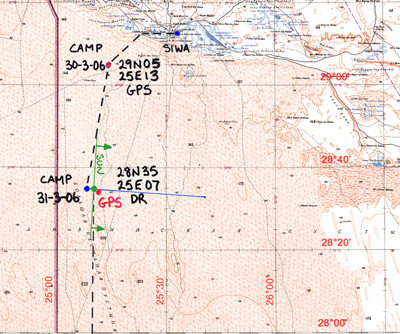 The thick red line at longitude 25E00 down the left hand side of these maps shows the border between Libya, on the left and Egypt, on the right. In general, I will mark our position as estimated by ded ("deduced") reckoning by a blue dot on the map. A green dot indicates the fixed position as determined by celestial navigation and a red dot is the GPS (or "actual") position. Latitudes and longitudes for these positions are written in black and followed by DR if they are Ded Reckoning positions, CN if they are Celestial Navigation positions and GPS if they are GPS positions. 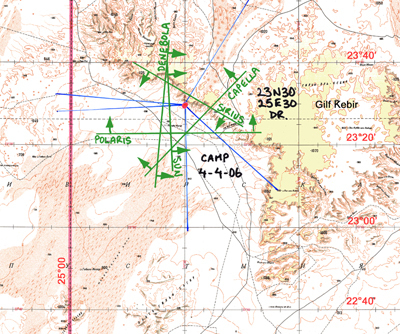 Azimuth bearings are drawn as blue lines radiating from the estimated position. The bearing may be towards the celestial body if the sextant altitude was greater than the calculated altitude (in which case the bearing is a true azimuth), or the bearing may be a "back azimuth" directly away from the celestial body if the sextant altitude is less than the calculated altitude. Position lines are drawn in green at right angles to the azimuth bearings at the intercept on the azimuth bearing line. The intercept is calculated from the difference between the sextant altitude and what the altitude should be as calculated from the estimated position. The green position lines are labelled to show the celestial body to which they refer, and there are a couple of small arrows showing the actual direction of the celestial body from the estimated position. As can be seen, the plot for the position of this camp is really rather good. The position lines for the sun, Sirius and Capella all pass through a single point and that point is confirmed by GPS to be our actual position. Without the Polaris sighting, this would be a perfect plot. 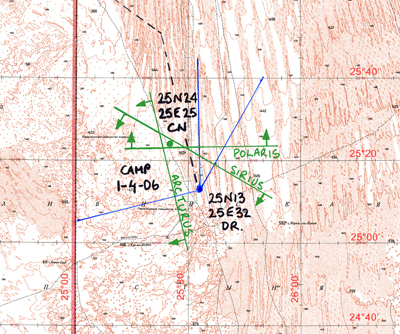 But the Polaris position line passes a little to the South and so taking account of this, I judged our position, as fixed by celestial navigation, to be 29N04,25E13 which was just a minute South of the actual position. The celestial navigation seemed to be working well and I was pleased with my evening's work. I never knew the GPS reading when calculating our position by celestial navigation. After working out our camp position during the evening, or possibly the next morning when incorporating a morning sun sight, I would only ask Gabor Merkl what our GPS position was when about to set off again in the cars. So I was never unconciously biased into trying to reach a particular position. 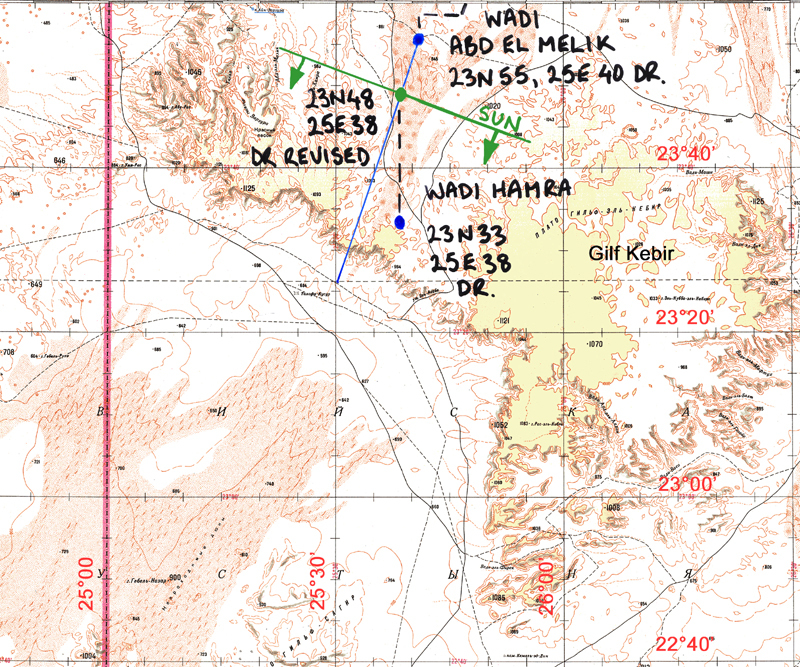 We headed into Siwa that morning and after refuelling and an enjoyable lunch at Abdu's restaurant, the group split up. Those who had only come for the eclipse part of the tour went back to Cairo. The rest of us who had signed on for a more extended trip into the South Sahara desert, set off into the dunes of the Great Sand Sea. Had we been able to get into Libya, our itenerary would have taken us down to Jebel Arkenu and Jebel Uweinat, two large mountainous areas in the South East of the Libyan Sahara desert. But our inability to pass through the Egyptian side of the border post at Sollum meant that we had to make a new itinerary which kept us on the Egyptian side of the border. We agreed that our new itinerary would take us down to the Libyan Desert Glass (LDG) area, which is actually all on the Egyptian side of the border. From there, we would head on down to the Gilf Kebir and look at some of the rock engravings and cave paintings in that area. Then up to have a look at the area which had announced a few weeks earlier as being the "Largest Crater in the Great Sahara". The crater had been discovered by geologists at Boston University by looking at satellite images. Given the remoteness of the area, we would almost certainly be the first people to visit the area since the find was announced to the press. To keep a track of our position by ded reckoning, I would note the odometer reading at the start of the trip and the compass bearing of our heading. Compass bearings were noted only as S or W or SSW for example, not as the degree of our heading. When there was a significant change in direction, I would note the odometer reading and the new heading. When we stopped for camp, I would again note the odometer reading. In this way I could plot our course during the day and so come up with an estimate for our position by ded reckoning. 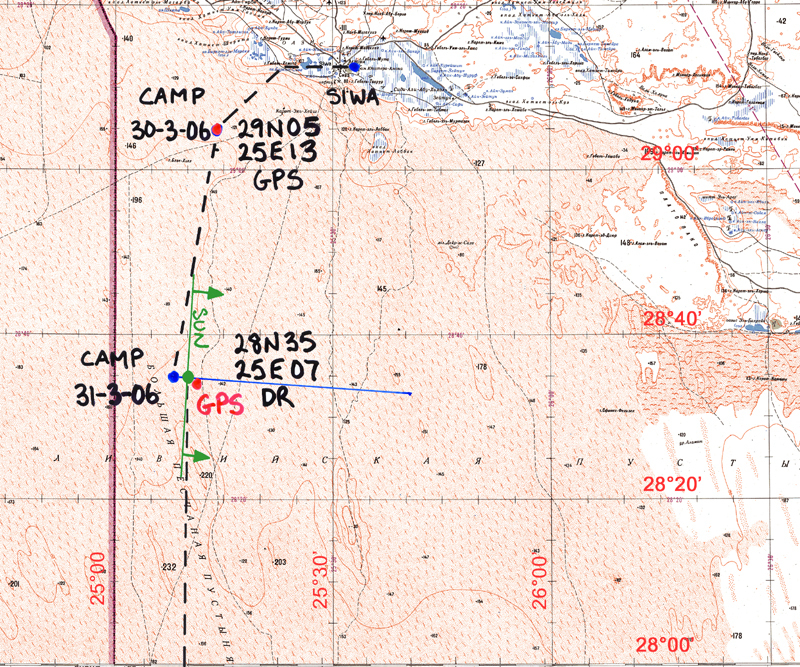 I did a brief compass check before leaving Siwa by taking a bearing outside the car and then again inside the car. There appeared to be no significant difference, so I counted myself lucky that this particular car was not introducing any deviation in the compass bearing. 443180 Pass last night's camp, then "slightly west of South". 443244 Stop for the night. My estimate of our position was 28N35,27E07. We camped in a sheltering curve in the dunes, but it was a windy night - too windy for doing any sights. We had to dig sand in around the tents to stop the wind picking them up and taking them away. Come the morning, the wind had died down. I was able to take a sun sight and at 05:14:20 GMT I obtained an Hs of 13� 19'. From our estimated position, the azimuth for the sun was 92� and the intercept for the position line was 1.5 minutes from the estimated position. I duly translated our DR position 1.5 minutes to the East. It was not until I got back home that I obtained a GPS position for this camp site and was quite gratified to see how close my revised DR position was. Having had breakfast, we broke camp and headed South. The odometer reading at the start of the journey was 443244. The sand here has been collected by the wind and laid out in long dunes up to 100 kilometres long, in between which are corridors which are perhaps five to ten kilometres wide. The corridors tended to take us somewhat East of South, so several times we found a gap in the dunes and crossed over into another corridor to the West of the one we had been travelling down. 443471 Stopped for lunch, having travelled 227 km. For the previous hundred kilometers had been travelling in a direction slightly West of South, but I figured that this pretty much cancelled out the Easterly leanings of the corridors at the start of the trip that morning. So I put our position as 227 km South of last night's camp at 26N47,25E07, though I suspected we were probably further west than that. We had stopped near a small hill, on which had been planted a number of the square petrol drums used by the British army during WWII. They were coated in a sheen of black oxide, as happens in time to ferrous materials in the desert. But the "Vacuum Oil Company Inc." logo stamped into the sides of the drums confirmed their vintage. It turned out that this had been a petrol dump set up by the Long Range Desert Group at the end of 1940. It was called "Gravel Cairn" and was in the dunes near "Mushroom Rock". Their rubbish still littered the area. 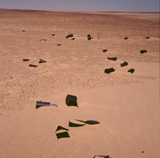 A number of the tins were of Italian tomatoes, and the wine bottles (still standing in the sand in this photo) had contained Italian wine. The Italian food may well have been liberated from Kufra when the oasis fell to the Free French on March 1st 1941. There were also a couple of empty bottles of Marmite - one of them still intact and with some Marmite inside! (You can never get all the Marmite out of those rotund little jars.) There was some discussion on whether this was an archaeological site or a rubbish tip! How much time has to pass before the latter turns into the former? I did a sun sight at 11:06:07 GMT. The Hs was 65� 49' and the resulting position line intercept was about 15' to the SSW of my DR position. 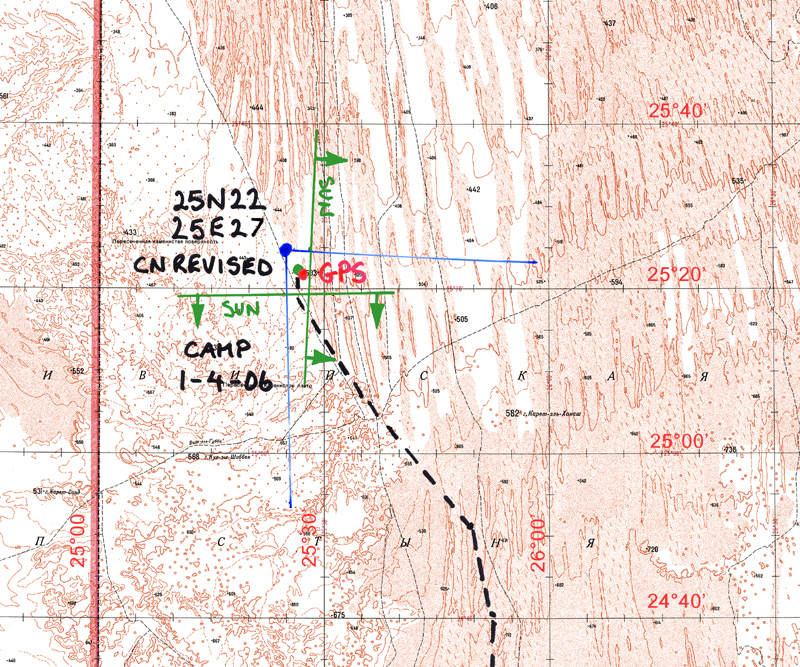 The sun sight confirmed that we were somewhat West of my DR position, as I suspected and so I duly translated my position to the intercept, giving my revised DR position as 26N33,25E01. 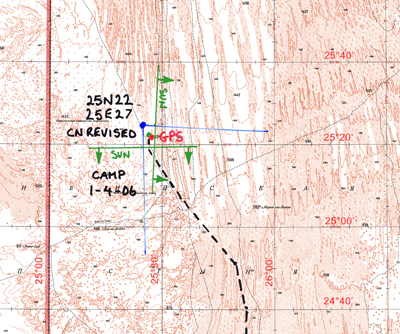 The position of this site in the LRDG records is 26N30,25E00 nominal and it is an interesting comment on the accuracy of the LRDG navigation that they were some 6' adrift of that position. 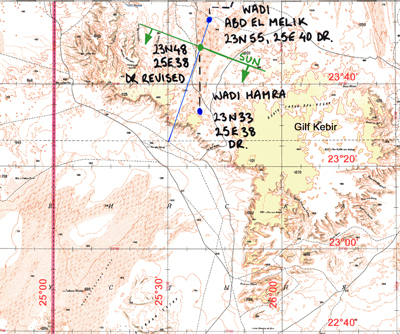 This gave our DR position on the edge of the Libyan Desert Glass area as 25N13,25E32. Unfortunately, I did not have a map for this area. 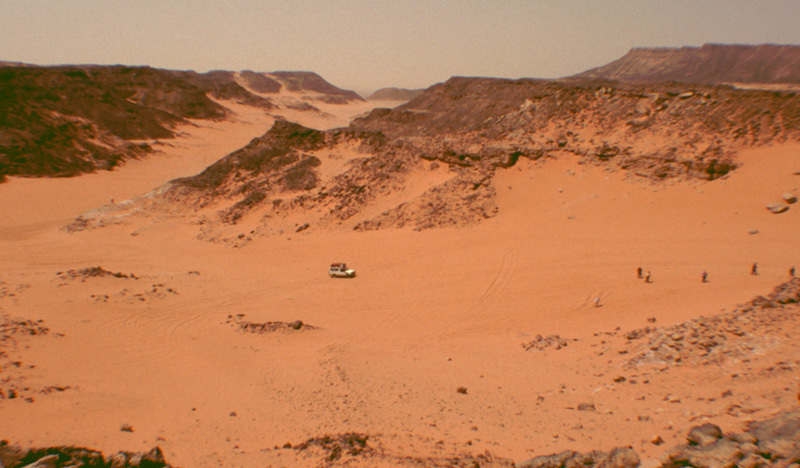 (I had not expected to be coming to this part of the Sahara!) For plotting purposes, I used another map and just relabled the degrees of latitude. The aspect ratio of the latitude and longitude degrees on the map would be about the same and that was what mattered. As can be seen, when my plot of our journey is put onto the correct map, it takes us into the dune corridors and back out to edge, which is not what happened. But that is how I called it at the time. Libyan Desert Glass (LDG) is the purest form natural silica glass to be found on earth. It is usually a light green in colour and can be found in a small oval area about 120km long by 50km wide which is (despite the name) on the Egyptian side of the border with Libya. It is found laying on the sand in amongst burnt igneous rocks on the floor of the corridors between the dunes. The size of chunks of LDG are usually small enough to fit easily in the palm of the hand, but have been found in large lumps weighing in at over 25 kgs. We spend the day carefully quartering the desert area within three kilometres or so of the camp. The richest area was about a kilometer away from the camp and only about 100m square and we quickly managed quite a haul of the silica glass between us, rounded and polished by the sand and the wind. This area is also rich in tools and artifacts spanning all of mankind's prehistory. It needs a good eye to pick out the tools shaped by man from the litter of rock fragments laying around, but Andras Zboray, our tour leader, and Gabor found many examples of stone knives, axes, spear points, and other tools - some knapped from LDG. I managed to find only a couple of nice knives, but was quite successful at finding LDG. That night, I took an average of three sightings on Sirius within a few minutes of each other. The average time of the sightings was 17:50:34 GMT and the average Hs was 42� 53'. After dinner that evening, I made single sightings on Arcturus and Polaris. For Arcturus, the Hs was 17� 09' at 18:36:13 GMT and for Polaris, the Hs was 25� 16' at 18:52:22 GMT. 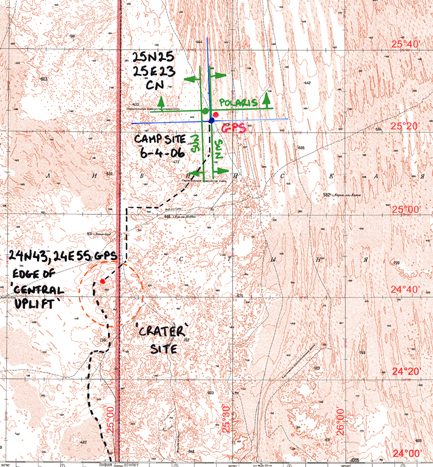 From the intersections of the three position lines, I fixed our position at 25N24,25E25. We spent two days at this camp site, so there was no travelling today. I decided to try something a little different and used my compass to take a bearing on the rising sun. I waited until the sun was directly in the East, then took a sighting to obtain an Hs of 16� 07'at 05:23:59 GMT. For my revised position of 25N24,25E25 I obtained an azimuth of 92� and plotted a position line at an intercept 3' from this position. At lunch time, I tried for a noon sight when the sun would be directly in the South and obtained an Hs of 69� 38' at 10:19:52 GMT. This produced an azimuth of 178� for the sun and I plotted a position line at an intercept 5' from our revised position. The intersection of the two sun sight position lines was about 7' away from the intersection of the two star sights the night before. But as there was no reason not to give all the sightings equal weighting, I put our final revised position at 25N23,25E26, mid way between the intersection of the star sightings and the sun sightings. 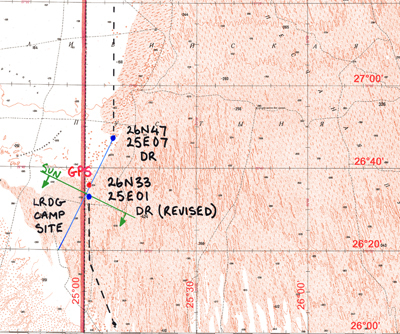 The GPS position for our camp was 25N22,25E27. This was not a bad result, just a minute or so away from our actual position. Thus we entered Wadi Hamra, one of the three wadis associated with the lost city of Zerzura for which many explorers spent much time searching in the 19th and early 20th century. I estimated our position to be 23N55,25E40. Wadi Hamra is a very dry and desolate place now, but as late as 70 years ago or so, this was a valley in which camel herders could graze their camels in the spring, and a strategic place where camel trains could find water. Now, there is a line of Acacia trees which mark the line of an underground river, but no sign at all of any surface water. What there is to see here are rock engravings made by nomadic pastoralists some 5,500 years ago. The engravings are of cows (lots of them), giraffes, ostrich, antelope and even some elephants. We found a number of new engravings that had not been discovered before and even the remains of a painting in a cave, the first discovered in this valley. I took a sun site at lunch time and at 10:46:56 obtained an Hs of 70� 37'. The azimuth of the sun was 199� from our estimated position and the intercept for a position line was some 7' from our DR estimated position. So, I transferred our position to the intercept at 23N48,25E38. By a quarter to five we werer on our way again and headed some 30 km South to camp for the night deeper into Wadi Hamra. That evening I took sightings on the stars Sirius and Capella. Sirius was a favourite because it is bright and Capella because its azimuth was aproximately at right angles to that of Sirius. 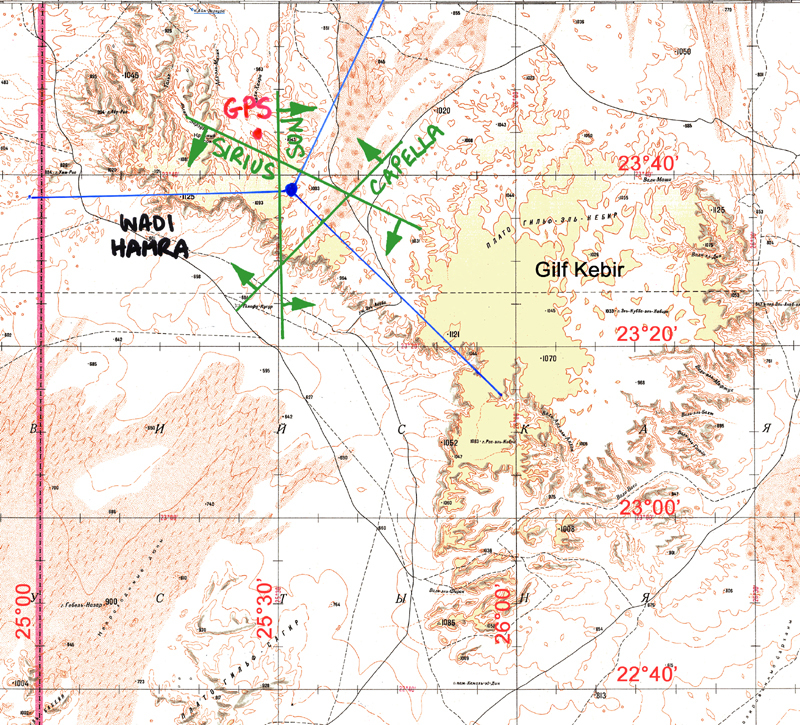 For Sirius, an Hs of 45� 24' was obtained at 17:33:02 GMT and for Capella, an Hs of 49� 35' was obtained at 17:34:53 GMT. 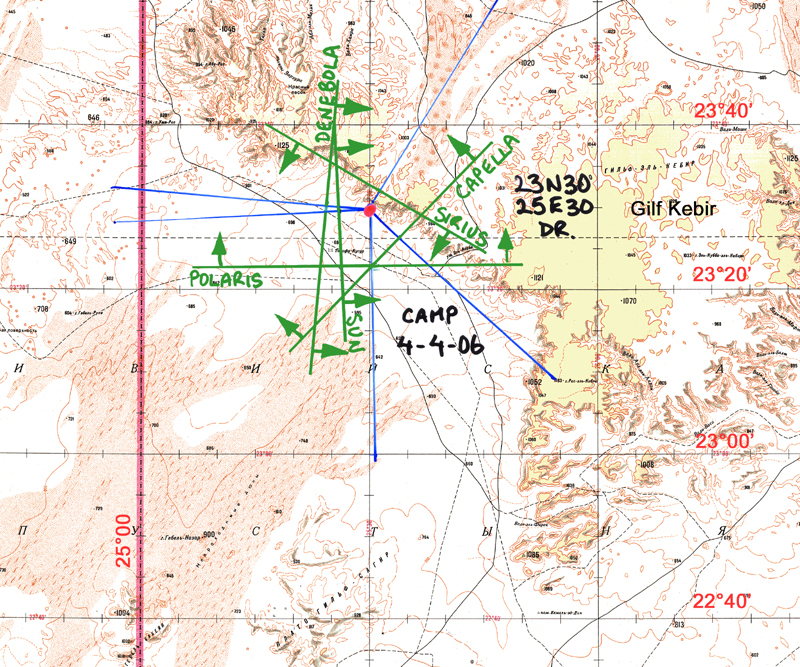 The resulting intersection of the plotted position lines gave a fixed position of 23N38,25E37. Our camp was on the Eastern side of the valley, so to get some sightings of the rising sun, I crossed over to the Western side of the valley and waited until my compass bearing of the sun was 90�. I took four sightings of the sun for an average Hs of 12� 38' at an average time of 05:06:29 GMT. The intercept was some 6' away from my fixed position of the previous night. The Hs of the sun was the average of four carefully taken sights. So instead of combining the sun sights with the star sights on an equal weighting basis, I transferred my estimated position to the intercept point, then recalculated position lines for Sirius and Capella based on this position of 23N38,25E31 to see what came up. The resulting triangle was somewhat open, which made me suspect the star sightings somewhat. I was becoming a little concerned that the sightings were not as tight I had come to expect historically, or, indeed, as they had been earlier in this trip. Perhaps, I thought, the index error had changed and the sextant was no longer reading 7' high as it had done for the past 20 years! Never-the-less, it was with some surprise that Gabor gave me a GPS position of 23N45,25E27. It is obvious that the Capella position line is a long way from where it should be. This could be explained if I misread the arc of the sextant and wrote down an altitude 10' lower than it should have been. An easy mistake to make, but one that is less likely to happen if a series of sights is taken and then averaged, rather than the single sighting from which this position line had been drawn. 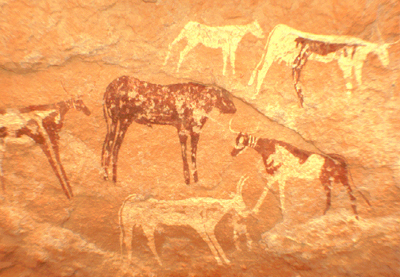 From Wadi Hamra, we sallied forth once again with the famous cave paintings of Wadi Sora as our destination. Wadi Sora is situated on Western side of the escarpment of the Gilf Kebir, which runs as a great cliff face a hundred metres or so high along its South-West side. But we were on the Eastern side of this escarpment and the only way down was via the Aqaba Pass, discovered by Lazlo Almasy in 1933. 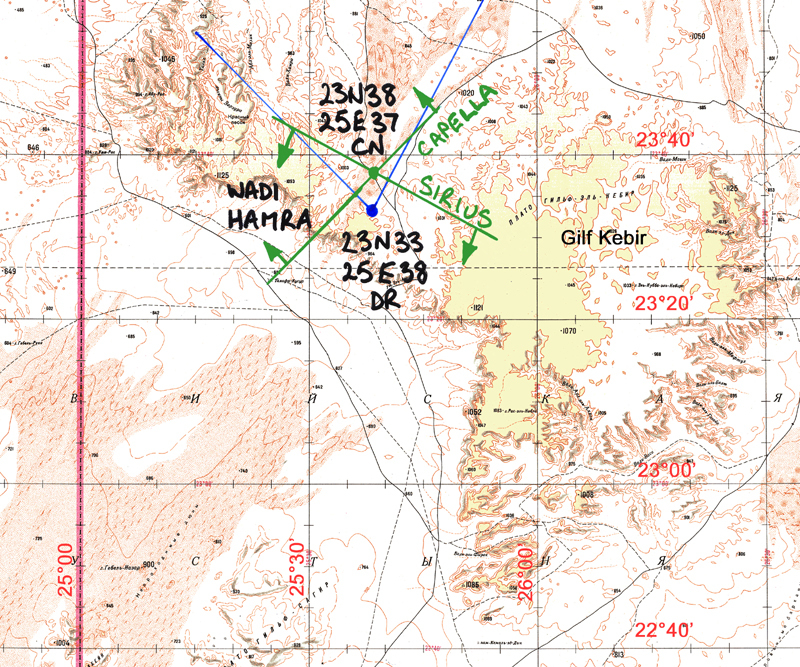 Aqaba is Arabic for "difficult" and even getting to the pass was not easy. We first had to get around an area of soft sand, so our course took us North, then East and finally South to the Aqaba Pass. I started keeping a log of our journey, but when I discovered that we were going around in a great loop to get to the pass, I decided to "go with the flow" until we reached the pass. Gabor Merkl took waypoints with his GPS and I have used these on the map to show our journey from Wadi Hamra to Aqaba Pass. We safely negotiated Aqaba Pass, with its steep slope of sand so soft that we had to get out and walk to allow the vehicles to get down safely. I have since read reports on the internet that the Aqaba Pass may be mined! (This is still some tension between Libya and Egypt. In 1973, the biggest tank battle in history was fought across the borders of these two countries when the egos of Gadaffi and Sadat clashed.) I am glad I did not know that at the time, but I can confirm that the pass is perfectly safe in this regard. As we reached the Aqaba Pass, the odometer reading was 444030. We proceeded about 30km NW along the edge of the escarpment before making camp in a small, sheltered canyon. I estimated our position as 23N30,25E30. I determined to make a serious effort that night to pin down a good CN position. With my doubts about the index error on the sextant in mind, I selected two pairs of stars in opposition. The index error (whatever it was) would be cancelled out for each pair of sightings. My North-South combination was Polaris and Sirius. My East-West combination was Denebola and Capella. I did three sightings on each star and took averages of the sightings. This would increase accuracy and minimise the potential for errors in noting the time or the altitude. An index error of +7' was used, that is the sextant was assumed to read 7' high on the actual observed altitude. In the morning, I also did a set of three sightings on the sun, rising in the east. This sun sight was in good agreement with the Denebola sighting of the night before. As an aside, I had been worried before the trip about potential problems of anomalous refraction, due to the hot sand heating up the lower levels of the atmosphere. The Denebola sighting was taken when the sand was still warm from its daily roasting, but the morning sun sight was taken when the sand had cooled down and was not heating up the air above it. The agreement of these two sightings is evidence that anomalous refraction is not a problem in the desert - at least, not at altitudes above about ten degrees anyway. As can be seen, the estimated position was later confirmed by Gabor's GPS to be our actual position. The large trapezium formed by these careful sightings now revealed that there had indeed been a change in index error. On average, the Hs of all the sightings was about 5' too low, so I had taken 5' too much off the altitudes as an index error. To distill a fix from all these position lines, I first bisected the sun and Denebola position lines to combine these two sightings. This bisection line and the Capella position line were again bisected to combine this opposition pair. The Polaris and Sirius position lines were bisected to combine this opposition pair. The intersection of these two bisections was the celestial navigation fix. As I hoped, the index error had indeed been cancelled out by choosing pairs of stars in opposition. The final CN position fix of 23N27,25E30 was about 3' away from the actual position. Not a great result, but quite acceptable. From our camp we made our way some 40km in a Westerly direction towards Wadi Sora, the so called "Cave of the Swimmers". 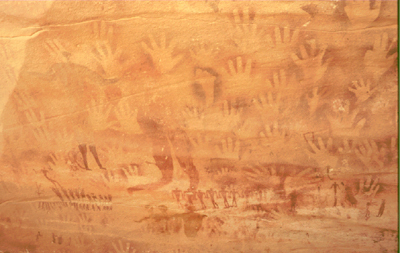 The paintings in this cave are some 5,500 years old. Though there is some damage to the paintings in the lower part of the cave from wind-blown sand, some of the pictures are almost pristine. This little group of "swimmers" are what gives the cave its name. Was there a lake nearby in which these pastoralist cow herders swam? Looking at the place now, it does not seem possible. Just around the corner was another cave. But in which we had to lay on our backs to see these wonderfully coloured cows on the "ceiling" at the back of the cave. Unlike the cave of the swimmers where reds are ubiquitous, here are yellows and whites, giving the paintings another dimension. A number of the cows do not have heads. These "headless beasts" are quite common in the art work here. The meaning of the lack of heads is not known. A great deal of ink has been used up in trying to give some meaning and cultural context to these paintings. The artist is elevated to a position of high social standing amongst his peers and the paintings are given cultural significance by associating them with some sort of "right of passage" ceremony. Of course, if the paintings did not signify something important, they would not be worth the intellectual effort spent in trying to decode them! After staring at the bewildering array of images for a while however, small cameo scenes start to stand out. 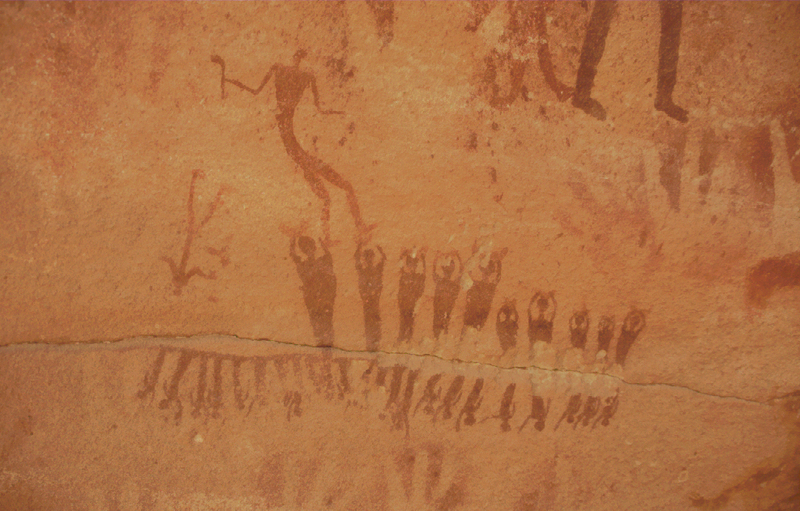 Here is one scene that is often shown on Sahara rock art websites. It is evidently a victory scene of some sort - the crowd cheering the figure with his axe aloft and the small figure laying on the ground to the left of the picture. But are those reflections below the cheering crowd? Is this a lakeside scene where the fault in the rock is the edge of the lake? Why are there more reflections than figures in the crowd? Who knows. We headed a little way further to the North West along the escarpment to a small canyon in which we camped for the night. I had not taken much notice of our wanderings, but our odometer reading of 444131 said that we had travelled some 71 km during the day and we were on the edge of the escarpment. According I set an estimated position at 25N50,25E05. That evening I had a real extravaganza of celestial sightings. I started with an evening sun sight. I decided to reduce my index error to +4' for this series of sightings. I was a little late for a sighting with the sun directly in the West, so at an average time of 16:09:06 GMT my average Hs for three sightings was 5� 31'. As the sun set and night fell, first Sirius became visible in the South and soon after that, it was possible to make out Orion. It was not long thereafter that all the major stars studded the velvety sky like scintilating diamonds. Then I set too and took three sightings on Canopus, Sirius, Capella, Polaris and (last, but not least) Arcturus. The data for these sightings is given below. It is easy to imagine that the more celestial bodies that are sighted, the more data you have and so the final fix will be more accurate. In fact, a mess of position lines can just be plain confusing! The sun and Arcturus are a obviously a pair of West-East opposites and so their position lines can be bisected with a dotted line to combine that pair. Similarly, Polaris and Canopus are a pair of North-South stars opposing each other in the sky, so their position lines can be similarly combined by a bisecting dotted line. These dotted bisecting lines meet at 23N38,25E05. Sirius comes within a few minutes of this position, but Capella is some five minutes away. The rational approach at this stage is to take 23N38,25E05 as a revised estimated position and recalculate the position lines for this position, but that seemed like a lot of work at that time of night.... So, I chose to ignore the Capella data and go with 23N38,25E05 as a final fix on our position. The GPS position was just a minute or so away at 23N39,25E06, so this was a reasonable end result. Our mission for today was to examine the site of "The Largest Crater in the Great Sahara". 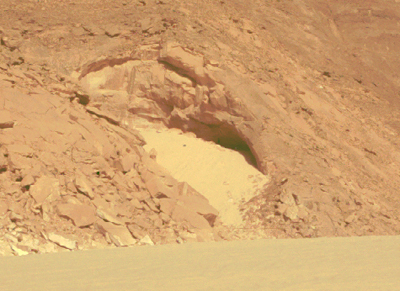 The site of this crater had been found by geologists from Boston university by examining Landsat satellite images for the area. The geologists had released their discovery to the press just a month earlier on the 4th March. Given the remoteness of the site, we were almost certainly going to be the first people to visit it since the announcement. 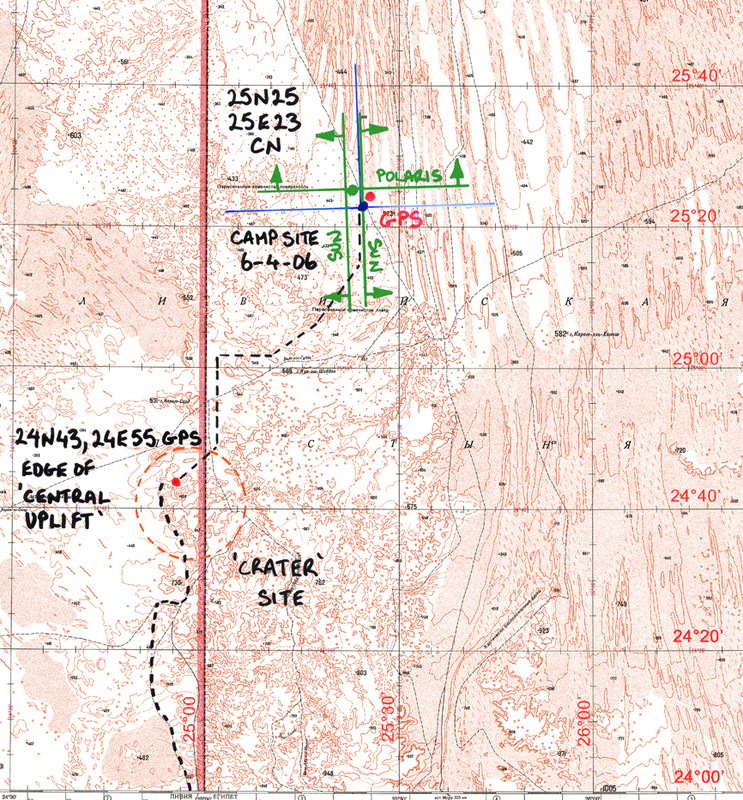 The outer ring of the proposed crater was some 31km in diameter and straddled the Libya-Egypt border. We stopped for a "pee-stop" in an area that could have been the surface of Mars. Indeed, in 1978 a team from NASA came out here to compare satellite images of the area with what was seen on the ground. This purpose of the expedition was better interpretation of satellite images of Mars! The sand is a reddish colour in this area with black volcanic cinder cones rising up as small hills through the sand. The area was heavily littered with black, burnt, igneous rocks. We examined a green plastic teapot that our driver, Said, had seen beside the heavily rutted track and stopped to pick up on the way. Of what possible use was a green plastic teapot out here? Watering the geraniums, we surmised? We were now in the crater area, looking at the Western edge of the central uplift area of the "crater". What we saw was uniform horizontal layers of sedimentary rock, undisturbed except by the processes of natural erosion. The jumbled, chaotic rock formation that we would expect to see in the central uplift area of a crater was not evident at all. We were travelling North along the Libya-Egypt border. Every so often a sign, stuck into an oil drum filled with cement, would proclaim that this was the border. We nosed into the start of a long corridor, stretching Northwards over the horizon, and found shelter in the curve of a dune on the Western side of the corridor where the sun would greet us in the morning. I estimate our position as 25N22,25E24. Gabor immediately found a number of stone knives, spear points and other tools. We spent the afternoon looking for stone tools and silica glass. I found a few nice pieces of LDG and a large chunk of fossilised wood, but no stone tools. The others did not find much in the way of stone tools either, so it is evident that our camp was also a camp or settlement in some bygone prehistoric age, though there is nothing now to suggest that this was a good site. After dinner that evening, I made a single sighting of Polaris, for an Hs of 25� 16' at 18:46:43 GMT. Another bright day dawns and I watch the sun rise over the dunes on the East side of the corridor. Morning is my favourite time in the desert. It is cool and the light is soft, giving the desert an other-worldly look. I waited until the sun was due East, then took a single sighting at 05:03:52 GMT, for an Hs of 12� 39'. Combining this with the sights of the previous evening, I noted that the two sun sights were separated by about 2'. This indicated that I should have applied an index error of 5' instead of 4'. With an index error of 5', the Polaris position line would have been 1' further South than I have drawn it. Combining all this gave a fix of 25N24,25E23, which was some 3' away from our GPS position of 25N24,25E26. This was my last effort at "traditional" ded reckoning and celestial navigation in the desert. We were in wind-down mode now, about to return to Siwa and make our way back to Cairo for the journey home. Though my ded reckoning was rudimentary at best, just noting the odometer readings and rough compass direction, I was constantly amazed at how close the DR position was to the final fix. It was very rare (only twice, I think) that the distance in nautical miles to an intercept from my DR position was not in the single digits. I had anticipated that a correction factor would have to be applied to the odometer readings to account for wheel slippage in the sand and weaving around obstacles. But in fact, the odometer readings turned out to be very accurate. I can imagine that odometer readings in combination with a sun compass would be very effective in keeping a good plot of one's track through the desert. The sun compass does not (to my mind) need to be over complex. It is relatively easy to construct a sun compass and to make a card, suitably adjusted for the time of year and the area to be visited. The A-12 Link sextant performed well in the desert environment and confirmed my expectations on ease of use. On Wednesday the 5th of April, for example, I was able to knock off a series of twelve sights on four stars in a period of twenty minutes - in the dark, ducking into the tent (where the light was) to note the reading and jumping out again for the next sight. I would challange anyone to do as well, on their own, using any other sextant. The single weakness of the bubble sextant is the inability to easily check the index error, as one is able to do with a marine sextant. On this trip, I seemed to have a problem with a wandering index error. It may be that in the heat of the desert, the aluminium body of the sextant warped and this resulted in a change in index error. When the index error became suspect, I was forced to adopt a strategy of choosing stars and sun sights in opposing pairs to cancel out the index error, whatever it was. On my final celestial fix, I was moving towards a strategy of sun sights with the sun due West in the evening and due East the next morning; and a sighting of Polaris at night. The opposing sun sights give a good idea of the current index error, which can then be applied to the Polaris sight. If the estimated position is a long way from the first stab at a celestial fix, it is usually necessary to recompute the position lines using the first fix as an estimated position to refine the final fixed position. But because in this case the position lines are vertical and horizontal, the first stab at a fix will be relatively tolerant of large errors in the estimated position, so a process of itteration is not necessary. My "Long Term Almanac" in conjunction with the programmable calculator also prooved accurate and easy to use, as did my clip board "plotting table". The accuracy of the fixes obtained was usually of the order of 2', or about 4 km. Only one fix was way off the mark, (Wadi Hamra, 4th of April), but that was probably due to a mistake in reading the sextant. Given the equipment I had, this level of accuracy is about the best that could be expected. Finally, it is good practice to take a number of sights on a the chosen celestial body, and then average the times and altitudes. This helps to eliminate mistakes in reading the altitude and taking down the time, and gives more accurate results. In March 2007, I returned to the Western Desert, once again taking my sextant with me. My navigation exercises were not as extensive, but I was able to put the lessons learnt during the 2006 trip into practice. 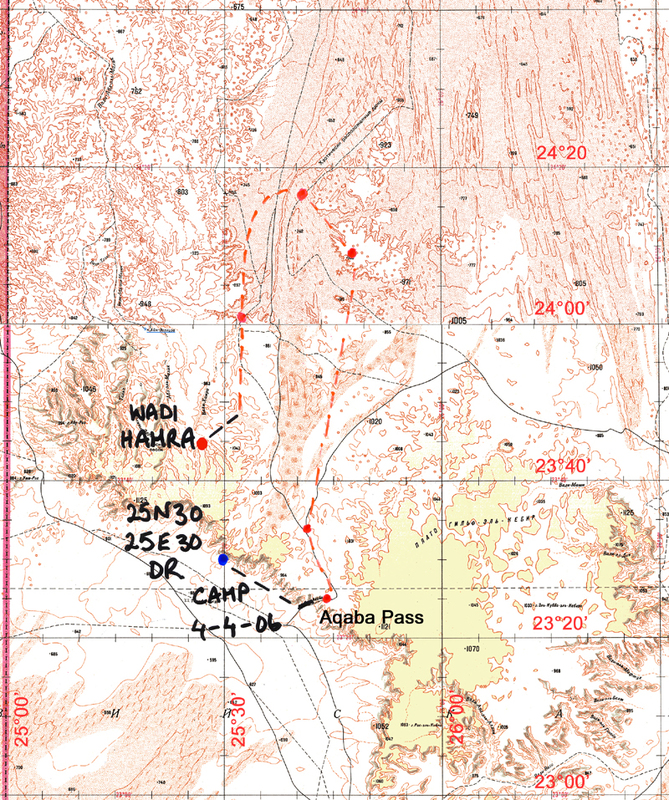 This links to a report of that the navigation done on the March 2007 trip.